« Vita Dermatology’s New Website! Do you want to find your youthful glow this Spring? 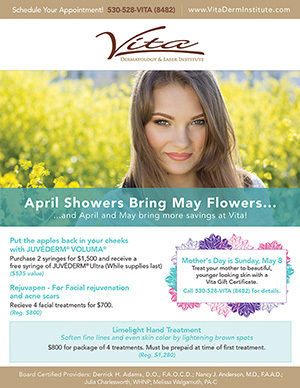 Now through May 31st, 2016, Vita Dermatology in Red Bluff has some great deals on Voluma and Rejuvapen. The treatments help with everything from adding more volume, to reducing fine lines and wrinkles, to reducing acne scars. – Recieve 4 facial treatments for $700. – Soften fine lines and even skin color by lightening brown spots. $800 for package of 4 treatments. Must be prepaid at time of first treatment.